Tag Archive | "Wrong Way Riegels"
How many times have you met people bearing nicknames bound to haunt them for the rest of their lives? This story is about one such person. Like Forrest Gump’s mysterious box of chocolates, Roy Riegels had no inkling, in childhood, as to what life would hold in store for him. Other than the fact that Roy was born in 1908, not much is known of his early life. But, we do know this. From 1927 to 1929, he played football for the Golden Bears at the University of California, Berkley. His coach, Nibs Price, said that Roy was the smartest player he had ever guided. Roy lived up to that praise; in his senior year, he earned the position of Team Captain, with All American Honors. On January 1, 1929, at the Rose Bowl in Pasadena, California, the Golden Bears played Georgia Tech, more popularly known as The Yellow Jackets. More than 70,000 eager fans swarmed into the stadium that day to cheer their heroes on. Halfway through the second quarter, Riegels, playing center, snatched up a Georgia Tech fumble just thirty yards from The Yellow Jackets’ end zone. In the thrill of the moment, dodging defenders and with the roar of the crowd in his ears, Roy was off and running — towards his own end zone … a full 65 yards away. What should have been a stroke of luck turned out to be a catastrophe, as Roy dashed ahead at full speed, oblivious to his coach’s pleas to reverse course. 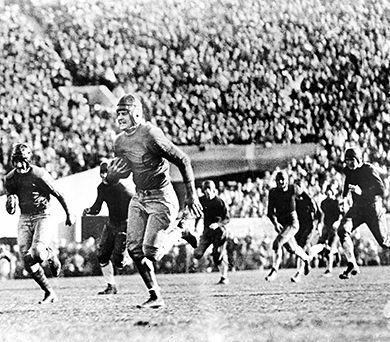 Benny Lom, a teammate and quarterback renowned for his speed, caught Roy at California’s three-yard line in an attempt to turn him around. Alas, a wall of Yellow Jackets sacked him with the ball resting at the one-yard line. Desperate, Roy opted to punt out of a bad situation. But Vance Marco of Georgia Tech blocked the punt, allowing his team to score a safety and gain a 2-0 lead over California. After graduation, he went on with his life. When World War II erupted, he enlisted in the United States Air Force. After serving his country, Roy divided his time between managing his chemical company and coaching football at the high school and college levels. In 1991, Riegels was inducted into the Rose Bowl Hall of Fame. Two years later, on March 26th, 1993, “Wrong Way” died at age of 84. 1998 saw his posthumous election into the University of California’s Hall of Fame. In 2003, his “wrong way” run was selected as one of the six “Most Memorable Moments of the Century” by a panel comprised of CBS officials and the College Football Hall of Fame. The next time you meet a person with a strange nickname, such as Nicky Blue, Joey Bananas, or Pancho Pete, ask them how they came by that name. It may reveal an interesting story!